Interoception, the sensitivity to visceral sensations, plays an important role in homeostasis and guiding motivated behaviour. It is also considered to be fundamental to self-awareness. Despite its importance, the developmental origins of interoceptive sensitivity remain unexplored. We here provide the first evidence for implicit, flexible interoceptive sensitivity in 5 month old infants using a novel behavioural measure, coupled with an established cortical index of interoceptive processing. These findings have important implications for the understanding of the early developmental stages of self-awareness, self-regulation and socio-emotional abilities. From the beginning till the end of a person’s life, parts of the body continuously send signals to the brain. Most of this happens without the person even being aware of it, yet people can become aware of the signals under certain circumstances. For example, we can feel our racing heart rate or the “butterflies in our stomach” when we are anxious or excited. This ability to consciously sense signals from the body is called interoception, and some people are more aware of these signals than others. These differences between people can influence a wide range of psychological processes, including how strongly they feel emotions, how they make decisions, and their mental health. Despite the crucial role that interoception plays in thought processes in adults, scientists know practically nothing about how it first develops. Progress in this field has been hindered largely because there was no way to measure sensitivity to interoceptive signals in infants. Now, Maister et al. have developed a new task called iBEATS that can measure how sensitive an infant is to their own heartbeat. During the task, five-month old infants were shown an animated character that either moved in synchrony with their own heartbeat or out of synchrony with their heartbeat. 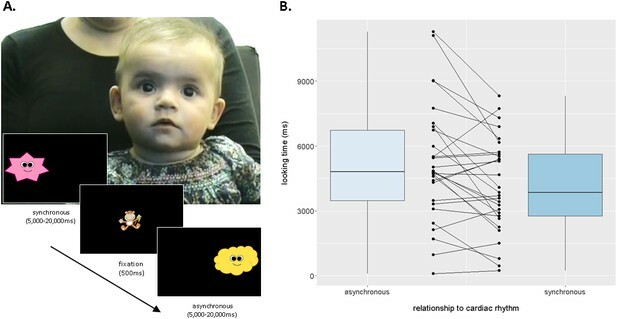 The infants spent longer looking at the character that was moving out of synchrony than the one moving in synchrony, suggesting that even at this early age, infants can sense their own interoceptive signals. As with adults, some of the infants were more sensitive to their heartbeats than others, and Maister et al. could see these differences played out in the infant’s brain activity via electrodes placed on the infant’s head. Infants who had shown a strong preference in the iBEATS task also showed a larger brain signal known as the Heart-Evoked Potential (or HEP). Furthermore, this brain signal got larger when infants viewed a video clip of an angry or fearful face. This suggests that the infants’ brains were monitoring their hearts more closely when they were confronted with negative emotions. This study provides a validated measure of interoception for very young participants. Using this task, researchers can now investigate which factors affect how awareness to interoceptive signals develops, including social interactions and the infant’s temperament. Maister et al. also plan to carry out longer-term experiments to learn exactly how interoception may influence the development of emotional abilities, and also what role it might play in disorders such as anxiety and depression. The findings of these future experiments may eventually guide interventions to treat these conditions. Our entire experience of the world is perceived against a pervasive backdrop of internal physiological sensations from our bodies. Our sensitivity to these visceral sensations, known as ‘interoception’, is thought to be the fundamental basis for subjective feeling states (Craig, 2009; Damasio, 2010), and important for maintaining homeostasis (Gu and FitzGerald, 2014). Interoceptive sensitivity is a stable trait which varies between individuals, and influences a range of psychological processes from emotion processing to decision-making and various psychological disorders (Critchley and Harrison, 2013). Inevitably, interoception has recently witnessed an exponential rise in interest across the neurosciences, psychology and psychiatry (Khalsa and Lapidus, 2016). Behaviourally, individual differences in interoception are commonly measured by assessing participants’ ability to count their own heartbeats (Schandry, 1981) or discriminate cardio-auditory synchrony from asynchrony (Brener et al., 1993). Interoceptive processing can also be observed in the electroencephalogram (EEG); the Heartbeat Evoked Potential (HEP) is an electrophysiological index of cortical cardiac processing, and is found between 250–600 ms after the cardiac R wave over frontocentral (Pollatos and Schandry, 2004) and parietal regions (Dirlich et al., 1998; Couto et al., 2015). HEP amplitude is positively correlated with interoception at rest (Pollatos and Schandry, 2004), and is also modulated by state changes in interoception such as during emotional processing (Fukushima et al., 2011). Beyond its fundamental role in adulthood, interoception has been given prominence in developmental theories, which highlight its importance in the infant’s experience of reward, motivation and arousal (Fogel, 2011; Mundy and Jarrold, 2010; Fotopoulou and Tsakiris, 2017). Interoceptive sensitivity may allow infants to perform crucial self-regulatory behaviours that facilitate homeostasis. By linking perceived internal sensations with events or objects in the environment, infants may be able to develop allostatic seeking or avoiding behaviours depending on the nature of the internal sensation. For example, accurately perceiving sensations of satiety and linking these sensations with feeding behaviour may allow infants to self-regulate their milk intake (Harshaw, 2008). Furthermore, the detection of unpleasant arousal states may initiate attentional disengagement or avoidance of an aversive stimulus. Therefore, individual differences in interoception may represent an important determinant in socio-emotional and physical development. However, despite much speculation regarding the developmental origins of interoception, developmental research in this area has been restricted to older childhood (Koch and Pollatos, 2014) due to methodological limitations. Here, we develop a novel behavioural measure of interoception in infancy, and present the first ever demonstration of interoceptive sensitivity at 5 months of age, coupled with electrophysiological markers, to show that (a) infants display an implicit sensitivity to interoceptive signals, and (b), that this sensitivity is responsive to socio-emotional processing demands, as in adults. We developed a novel implicit behavioural measure, the Infant Heartbeat Task (iBEAT), which employs a sequential looking paradigm to assess whether infants are able to differentiate synchronous from asynchronous cardiac rhythms. Twenty-nine infants (17 males, mean age = 5.13 months, SD = 0.29) viewed an animated character, moving either in synchrony or asynchrony (±10% speed) with the infant’s own heartbeat, during continuous eye-tracking (Figure 1A). A clear visual preference for the asynchronous stimulus emerged at the group level, MASYNCH = 5194 ms, SD = 2697, MSYNCH = 4170 ms, SD = 2167, t(28)=-3.267, p=0.0029, Cohen’s d = 0.40 (Figure 1B, also see Figure 1—figure supplement 1), indicating that infants displayed an implicit sensitivity to interoceptive signals, and an ability to integrate these interoceptive signals with external visual-auditory stimuli. As with adults, there were individual differences in the direction and magnitude of preference (Figure 1B). Infants differentiate between synchronous and asynchronous cardiac rhythms in a sequential looking paradigm (iBEAT task). (A) iBEAT paradigm. Infants viewed trials alternating between synchronous and asynchronous cardiac rhythms, presented either on the left or right of the screen. Stimuli remained on the screen for 5000 ms, after which time its continued presentation depended on infant attention (max. 20,000 ms). Informed consent was obtained from the caregiver of the infant featured in Figure 1A. (B) Boxplot quantification of average looking times (ms) to stimuli that were asynchronous or synchronous with infants’ own cardiac rhythm (N = 29 infants, paired t-test, p=0.0029). Strip-chart points indicate pairs of raw data points from individual infants, reflecting individual differences in looking behaviours. Boxplot whiskers denote ±1.5*interquartile range limits. We then measured HEP amplitude in the same infants whilst they viewed short video clips of emotional and non-emotional facial expressions (Missana et al., 2014). First, we investigated the relation between the behavioural cardiac discrimination performance and HEP amplitude collapsed across emotion conditions to obtain a measure of baseline HEP independent of emotion. Given the varied nature of the topography and timing of HEP in adults (Kern et al., 2013), we used a non-parametric Monte-Carlo cluster-based approach (Maris and Oostenveld, 2007) in three broad bilateral regions of interest (ROI: frontal, central and parietal, see Figure 2—figure supplement 1) across a 150–300 ms time window after the R wave. This time window was chosen to account for the infants’ rapid heart rate (mean R-R interval = 422.98 ms, SD = 25.36). We calculated a Cardiac Discrimination score as the absolute proportion difference between looking times to the synchronous and asynchronous stimuli during the iBEAT task. Individual Monte-Carlo cluster-based regression analyses were carried out for each of the three ROIs (Couto et al., 2015; Canales-Johnson et al., 2015). In the parietal ROI, a midline cluster (P2, POz, Pz) between 206–272 ms after the R wave was found to significantly correlate with infant cardiac discrimination, p=0.019, TSUM = 577.0. HEP amplitude was higher for infants who showed a greater discrimination between synchronous and asynchronous cardiac rhythms during the iBEAT task (Figure 2, also see Supplementary Results). The amplitude of the Heartbeat Evoked Potential is related to individual differences in infants' behavioural cardiac discrimination. (A) Topographical representation of the significant midline parietal cluster in which HEP positively correlated with cardiac discrimination on the iBEAT task (N = 22 infants, Monte-Carlo cluster regression, p=0.019). Colorbar represents cluster statistic (t). (B) Scatterplot illustrating the positive correlation between cardiac discrimination and HEP amplitude. Shaded area represents 95% confidence interval of fitted regression line, r = 0.52, p=0.013. HEP amplitude is the subject-wise average signal from the midline parietal cluster (P2, POz and Pz) across the 206–272 ms time window of all HEP segments (irrespective of emotion observation). We next investigated emotion-specific modulations in HEP amplitude, by individually comparing HEPs in each emotion condition to the neutral baseline (as in [Couto et al., 2015]), again using a Monte-Carlo cluster analysis. In the frontal ROI, the cluster-permutation analysis identified a significant cluster for both fear observation, p=0.0015, TSUM = 1842.2, and for anger observation, p=0.002, TSUM = 1994.8. Amplitude was significantly higher during fear and anger observation than during neutral observation (Fig, 3A). The effects extended across the entire time window (150 ms-300ms after the R wave), and the clusters closely overlapped in topography (Figure 3B). There were no significant clusters in parietal or central ROIs, and no significant clusters emerged for the happiness vs. neutral comparison. An identical analysis on the ECG channel did not identify any significant temporal clusters discriminating between emotional conditions, confirming that the effect was specific to the cortical processing of the heartbeat and not due cardiac field artefacts (Figure 3C). An analysis on the EEG signal time-locked to the emotional stimulus, rather than the heartbeat, did not show any significant differences between emotions in the specific frontal ROI identified in the HEP analysis, suggesting that the emotional modulation of the HEP was not merely an artefact of ERPs to emotional expressions in the same areas (see Supplementary Results). The Heartbeat Evoked Potential is modulated by infants' observation of negative emotional expressions. (A) Average HEP amplitude (across representative frontal channels common to fear- and anger-specific clusters) for the four emotion conditions. Shaded region represents the time-window analysed. (B) Topographical representation of positive frontal clusters, showing significantly higher activity during negative emotion (i.e. fear and anger) versus neutral observation (N = 22 infants, Monte-Carlo cluster analysis, p≤0.002). Averaged across 150–300 ms period. Colour bar shows Monte-Carlo cluster statistic (t). (C) Average ECG signal across the four emotion observation conditions. Here, we report the first evidence of implicit neurobehavioral sensitivity to interoceptive signals in early infancy. Infants’ ability to discriminate cardiac-audiovisual synchrony during the iBEAT task suggests that they are not only sensitive to internal sensations, but are also able to integrate interoceptive information with stimuli in the environment to drive visual preferences. In adults, the relationship between the internal and external experience of the body has been shown to play a critical role in the malleability of body ownership (Tsakiris et al., 2011; Suzuki et al., 2013; Aspell et al., 2013). Therefore, the ability to integrate interoceptive and exteroceptive information may be central to infants’ developing awareness of their own body boundaries. Furthermore, this integration process could be a precursor to mechanisms which allow the attribution of reward value to certain events and objects. The ability to preferentially orient to specific aspects of the environment that elicit positive interoceptive sensations, and to avoid aspects that lead to aversive or over-arousing bodily states, may provide the basis for an emerging homeostatic self-regulatory capacity in the developing infant (Gu and FitzGerald, 2014), via a process of interoceptive inference (Seth, 2013; Allen et al., 2016). This process is likely to be essential for guiding learning towards intrinsically motivating classes of stimuli, for example faces (Quattrocki and Friston, 2014). A difficulty in detecting interoceptive states, or a subsequent disruption in ascribing interoceptive ‘value’ to the environment, could lead to atypical development in emotional, cognitive and social domains (Mundy and Jarrold, 2010; Quattrocki and Friston, 2014). The developmental trajectory of interoception may therefore provide strong clues as to the origins of certain psychopathologies (Quattrocki and Friston, 2014; Murphy et al., 2017). We also demonstrated that a cortical index of interoceptive processing, the HEP, is particularly sensitive to emotional processing, especially negative emotions, in infancy as it does in adulthood. These findings indicate that infants’ state interoceptive processing and its cortical representation is dynamic, flexible and responsive to task demands. These results support a proposed relationship between online cardiac signalling and emotional evaluation in early infancy, which has already received persuasive support in adults (Garfinkel and Critchley, 2013). Our results also have important bearing on the study of self-awareness, the development of which has long been a topic of fascination in the behavioural sciences. It is now known that self-awareness in adulthood has close links with interoceptive abilities (Tsakiris et al., 2011; Filippetti and Tsakiris, 2017), but how or when this link emerges has never yet been investigated. Our results allow future research to assess the relationship between individual differences in interoceptive sensitivity and the achievement of various milestones in the development of self-awareness, for example mirror self-recognition or the onset of episodic remembering. The implicit, non-verbal nature of the newly-developed tasks also raise the possibility of taking a comparative approach by measuring interoception in other non-human animals (Evrard et al., 2014). This will provide a unique opportunity to learn more about the evolutionary trajectory of interoception and embodied self-awareness. In conclusion, the discovery that infants are sensitive to interoceptive sensations has wide-reaching implications for the study of interoception, self-awareness and cognitive development, and paves the way for understanding how individual differences in interoception can develop, persist and influence the way in which we experience ourselves and the world. As the rhythm of the asynchronous stimuli could either be faster or slower than the infant’s own heartbeat, two further one-tailed t-tests were carried out comparing these two types of asynchronous stimuli to the synchronous stimulus separately to ensure that the asynchronous preference held in both cases. Infants looked longer at both the slower stimulus, M = 4829, SD = 2829, t(28)= - 1.977, p=0.029 (1-tailed), d = 0.25, and the faster stimulus, M = 5547, SD = 3190, t(28)= 3.038, p=0.0025 (1-tailed), d = 0.475, as compared to the synchronous stimulus. Looking times for the faster vs. the slower stimulus did not significantly differ, p>0.05. These analyses are illustrated in Figure 1—figure supplement 1. Interbeat intervals were then calculated for each condition averaged across the group of infants; M(asynch-faster) = 375 ms (SD = 15), range = 361–392 ms, M(asynch-slower) = 417 ms (SD = 18), range = 399–436 ms, M(synch) = 398 ms (SD = 18), range = 376–419 ms. These data are displayed in Figure 1—figure supplement 2. To ensure that the correlation found between cardiac discrimination and HEP amplitude was not due to cardiac field artefacts, we also calculated the correlation coefficient between the cardiac discrimination score and the average ECG amplitude across the time window of significance (206–272 ms). The correlation was non-significant, r = –0.15, p=0.502, suggesting that the observed relationship between cardiac discrimination and HEP amplitude was specific to the cortical processing of the heartbeat rather than cardiac activity per se. To ensure that the emotional modulation of HEP observed for fear and anger was not instead caused by an ERP to the emotional expressions in the same channels, we also carried out an analysis of the EEG signal time-locked to the onset of emotional expressions, instead of heartbeats. Segmentation was performed surrounding the entire duration of each emotional expression (2000 ms). We employed the same Monte-Carlo random cluster permutation method as used for the HEP analysis, to ensure comparability. First, the entire time-window was interrogated for spatiotemporal clusters that significantly discriminated fear or anger from neutral conditions, within the eleven channels that we found emotional modulation of HEP (see Figure 2—figure supplement 1). No significant clusters were revealed in these channels, neither for the anger-neutral comparison (p≥0.213) nor the fear-neutral comparison (p≥0.395). We repeated this analysis with a more specific temporal focus on 300–600 ms after emotional expression onset, which has been identified as a likely time-window for infant ERP to emotional expressions (Kobiella et al., 2008). Again, no significant clusters were revealed, either for the fear-neutral comparison (no clusters) or the anger-neutral comparison (p=0.279). Finally, we extracted average amplitude of the EEG signal from the critical channels time-locked to the emotional expression for each individual infant, and calculated correlation coefficients between this signal and the average HEP amplitude during observation of that same emotion. If our HEP results were actually caused by ERP signal fluctuations, there should be a significant correlation between these two variables. Importantly, there were no significant correlations between average ERP amplitude and HEP amplitude, either for fear (r = –0.171, p=0.470) or anger (r = 0.175, p=0.436). The results of these analyses suggest that the emotional modulation of the HEP signal in frontal areas is not an artefact of more general ERPs in response to these emotions in the same locations. Forty-one healthy, full-term infants were tested in total, at 5 months of age (19 males, mean age = 5.10 months, SD = 0.29). The expected effect sizes were not known in advance, so samples were selected according to similar adult literature (e.g. [Fukushima et al., 2011]) assuming an approximate 50% attrition rate, which is usual in infant EEG studies with this age range. Infants were recruited using a marketing company database, which provides data information from consenting mothers to be. Recruitment leaflets were sent to each household. Parents were able to participate by signing up to our online database or by contacting us via email. The study was completed in one session, and conducted according to the Declaration of Helsinki and all methods were approved by the Royal Holloway University of London Departmental Ethics Committee. For this task, infants were seated in a high-chair approximately 60 cm away from a computer screen integrated into a Tobii T120 eyetracker. Three disposable paediatric AgCl electrodes were attached to the infants’ chest and stomach in a 3-lead ECG setup, to monitor their cardiac activity throughout the task (Powerlab, ADInstruments, www.adinstruments.com). The R-peaks of the ECG were identified online using a hardware-based detection function (‘Fast Output Response’ function) from ADInstruments, and stimulus presentation was managed by a custom-made algorithm implemented in Matlab 2015a (MathWorks, Natick, MA). The onset of each R wave in the ECG trace was defined as the moment the voltage exceeded a predefined threshold, set individually for each infant. Once the function detected a R wave, a transistor-transistor logic (TTL) pulse was then sent to the computer presenting the audiovisual stimuli, with a delay of less than 2 ms as confirmed by internal lab reports. In each trial, infants were shown an animated character, which moved rhythmically up and down, either synchronously with the infant’s own heartbeat, or asynchronously (±10% speed). Each up-down movement was accompanied by an attractive sound to mark the rhythm. For synchronous trials, the custom-made algorithm presented an auditory tone and change in position of the animated character upon the receipt of every TTL pulse. For asynchronous trials, the algorithm produced a cardiac-like rhythm that was ±10% the speed of the infant’s average heart rate recorded from the previous trial. Trials alternated between showing either asynchronous or synchronous movement, and the character could appear either on the left or the right of the screen (see [Phillips-Silver and Trainor, 2005]). Once a steady ECG trace had been achieved, and the eyetracker had been calibrated to accurately detect the infant’s fixations, the computer task was started. Infants were shown the character for a minimum of 5 s, after which the continued presentation of the character was contingent on the infant’s attention. If the infant continued to look at the character, it remained on the screen for a maximum of 20 s. If the infant looked away from the character for longer than three consecutive seconds, the trial was automatically terminated by the computer program and the next trial begun. Between each trial, an attractive central fixation clip was presented to re-engage the infants’ attention. The task was terminated when four consecutive trials did not receive sufficient fixation to extend the trial time past the five second minimum, or when the infant became too tired or fussy to continue. The EEG recording was prepared whilst the infant was seated on their caregiver’s lap. A BioSemi elastic electrode cap was fitted onto the infant’s head, into which 64 active Ag-AgCl electrodes were fixed according to the 10/20 system. An external electrode was attached to the infant’s upper left abdomen to provide an ECG trace sufficient to detect the R-wave offline. The EEG and ECG signals were recorded using the BioSemi ActiveTwo system (BioSemi, Amsterdam, The Netherlands), with a sampling rate of 1024 Hz and band-pass filtered online at 0.16–100 Hz. The standard BioSemi references Common Mode Sense (CMS) electrode and Driven Right Leg (DRL) electrode were used. Once clear EEG and ECG signals were obtained, the infant was repositioned 60 cm in front of a 29’ computer screen. The caregiver was asked to avoid interacting with the infant or looking at the screen during the task. The task comprised of short video clips of females making emotional expressions, following the paradigm of Missana et al. (2014). The standardised clips were sourced from the Montréal Pain and Affective Face Clips (MPAFC [Simon et al., 2008], RRID:SCR_015497) database. Happiness, fear, and anger were selected as emotions of interest. A neutral stimulus was also included, in order to provide a ‘no emotion’ control condition for comparison. Each video was modified to last for three seconds in total; this duration was comprised of a 1 s period showing the face with a neutral expression, then a 1 s dynamic period when the emotional expression manifested, and a final second freeze-frame of the expression at its peak intensity (Missana et al., 2014). The videos featured four different female models, and were cropped around the models’ faces using a soft circular template to remove extraneous features. Trials were presented in a pseudo-randomized order, ensuring that trials featuring the same model and emotion were not presented consecutively. Between each trial, infants were shown an attention-getter, consisting of a short audio-visual clip of an engaging, non-social object presented centrally on the screen. When infants’ attention failed to return to the screen for two consecutive trials, the experimenter (positioned behind a curtain partition) initiated a longer video clip with music which gave the infant a short break and an incentive to reorient to the screen. Once the infant’s attention was recaptured, the experimenter manually recommenced the next trial. If the infant showed prolonged inattention (defined as having not attended to four consecutive trials) or fussiness, the task was terminated. A maximum of 48 trials were presented. Stimulus presentation was controlled using Presentation software (Neurobehavioural Systems, Inc.). Mothers and infants familiarised themselves with the testing room. Infants first performed the iBEAT task. After a short break for feeding and changing if needed, they were then placed on their mother’s lap for the EEG cap and electrodes to be fitted. Once the EEG signal was clear and the infant was ready, they were returned to the high-chair and the Emotion Observation Task was run. The cap and ECG electrodes were then removed, and mother and infant were taken to a comfortable rest area to take a break, feed and change if necessary. The mother then completed a brief questionnaire and further behavioural task (the results of which will be reported in a separate publication) before being thanked, debriefed and given a small gift and monetary compensation for travel costs. Looking time data were processed offline. Only trials in which there were no movement artefacts in the ECG recording were included in the analysis. Infants were excluded if they did not complete a minimum of eight trials in total (four in the synchronous and four in the asynchronous conditions). In total, seven infants were unable to commence the task, due to the eyetracker being unable to detect the infant’s eyes (N = 5) or the ECG signal having a high level of interference (N = 2). Of the remaining 36 infants who took part in the task, seven infants were excluded due to insufficient artefact-free trials (19%), leaving 29 infants remaining in the final analysis (see Table 1). Mean number of valid, artefact-free trials in the iBEAT task included in the final sample, for each age group and condition. Standard deviation from the mean indicated in brackets. This table relates to the data displayed in Figure 1. Out of the full sample, thirty-nine infants completed the EEG recording. Offline EEG pre-processing was performed using BrainVision Analyzer software (Brain Products, Munich, Germany). The continuous EEG data was filtered offline with a bandpass filter of 0.1–30 Hz (24 dB/oct) and a 50 Hz notch filter. An Independent Component Analysis (ICA) was performed on raw EEG data to remove eye-movement artefacts and Cardiac Field Artefacts (CFA) (Terhaar et al., 2012). Using ICA to remove CFAs has been shown to be highly effective in removing cardiac artefacts from the EEG signal (Terhaar et al., 2012; Park et al., 2014; Luft and Bhattacharya, 2015). Bad channels were replaced using topographic interpolation. The data was then segmented into a 2000 ms epoch (1000 ms to 3000 ms) time-locked to the onset of the presentation of the emotion stimulus. This period was selected as this was when the observed emotional expression was at peak intensity. The data was then re-segmented to extract the HEPS, with a duration of 600 ms (−200 ms to 400 ms) time-locked to the R-wave. The resulting segments were baseline corrected using an interval from −200 ms to −50 ms to avoid artefacts from the R wave rising edge (Canales-Johnson et al., 2015). Semi-automatic artefact rejection was combined with visual inspection for all participants. Epochs exceeding a voltage step of 200 µv/200 ms, a maximal allowed difference of 250 µv/200 ms, amplitudes exceeding ±250 μV, and low activity less than −0.5 μV/50 ms were rejected from analyses. Infants who completed less than 25% of the total trials (less than five trials) in each emotion condition were automatically excluded. In total, 7 infants (18%) of the infants were excluded from the EEG analyses based on these criteria which is in line with other infant EEG studies. Segments were then re-referenced to the average and grand averaged (see Table 2). Mean number of trials, heartbeats and valid HEP segments extracted for each emotion condition (standard deviation in brackets), N = 22. This table relates to data displayed in Figure 3. As a central aim was to investigate whether the observed behavioural cardiac discrimination was related to HEP amplitude during the EEG recording, we restricted EEG analysis to those infants who had valid, complete data from both the EEG task and the task (N = 22). To investigate whether behavioural cardiac discrimination was related to HEP amplitude, HEP segments were collapsed across emotion conditions in order to get an estimate of HEP amplitude independent of specific emotional processing demands. All tests were evaluated against a two-tailed p<0.05 level of significance. For the HEP analysis, a Monte-Carlo random cluster-permutation method was implemented in FieldTrip. This method corrects for multiple comparisons in space and time (Maris and Oostenveld, 2007). Using this method, all samples that showed a significant (p<.05) relationship with our independent variable were clustered according to spatiotemporal adjacencies, and cluster-level statistics were calculated by taking a sum of the t-values for each cluster. A Monte-Carlo permutation method then generated a p-value by calculating the probability that this cluster-level statistic could be achieved by chance, by randomly shuffling and resampling the independent variable structure a large number of times (2000 repetitions) (Maris and Oostenveld, 2007). Spatiotemporal clusters that had a resulting Monte-Carlo corrected p-value of less than the critical alpha level of. 05 were interpreted as ‘significant’. For both the iBEAT task and the HEP measurement, data collection was not performed blind to the experimental condition to which each trial belonged, due to the requirements for stimulus and cardiac monitoring during the task. However, for HEP analysis, experimental condition was removed from the data after data collection and all EEG pre-processing was performed blind to the conditions of the experiment. Condition was revealed at final statistical analysis so that specific emotions could be compared to the neutral condition. Both reported tasks had within-subjects designs involving no group allocation; therefore, blinding to any between-subject conditions and randomization to such conditions was not applicable. Electroencephalography and Clinical Neurophysiology/Evoked Potentials Section 108:299–305. Journal of Comparative Neurology 522:64–97. International Journal of Psychophysiology 79:259–265. Social Cognitive and Affective Neuroscience 8:231–234. Trends in Cognitive Sciences 18:269–270. Infant and Child Development 13:341–348. Neuroscience & Biobehavioral Reviews 47:410–430. Proceedings of the Royal Society B: Biological Sciences 278:2470–2476. Thank you for submitting your article "Neurobehavioral evidence of interoceptive sensitivity in early infancy" for consideration by eLife. Your article has been reviewed by two peer reviewers, and the evaluation has been overseen by Sid Kouider acting as the Reviewing Editor and Sabine Kastner as the Senior Editor. The following individual involved in review of your submission has agreed to reveal her identity: Sarah Garfinkel (Reviewer #2). The reviewers have discussed the reviews with one another and the Reviewing Editor (Sid Kouider) has drafted this decision to help you prepare a revised submission. The reviewers found that your paper describes a novel and interesting study investigating interoceptive sensitivity in infants, but a number of important substantive points have been raised. In particular, the study remains inconclusive as to whether the neural signature used in your study really taps onto the modulation of interoception by emotional stimuli. In addition, the reviewers and editors believe that the methods should be clarified as they remained difficult to grasp for assessing the validity of your findings. Further analysis are also required to account for potentials biases in the results (i.e., the potential effect of novelty surrounding trial type, see comments by reviewer 2), and some of the interpretations appears to be too speculative and should probably be toned down (see comments by reviewer 1). In light of these issues, we cannot offer to publish your paper in eLife, as it stands. If, however, you feel that you can address all of the points raised below, and make a strong case, we shall be willing to consider a revised version of your paper for publication. A major issue concerns the interpretation derived from the fact that emotional expressions modulate Heartbeat Evoked Potentials (HEP, Figure 3). The HEP is an EEG component, which is time-locked to the heart beat. However, although they are differences across emotions, this might be the reflection of other sources that would show processing difference regardless of the heart beat: they might reflect the modulation of event-related potentials triggered by the emotional stimuli, although these amplitude differences would still show up when time-locking the analysis to the heart beat. In other terms, the reader might find this finding inconclusive and it seems important to show some degree of specificity to the HEP. This might be done by inspecting the results time-locked to the stimulus onset rather than the HEP, which might differ, or to show that some aspects of the HEP (for instance the phase) are 'specifically' modulated by emotional stimuli. This might also be discussed in an attempt to make the interpretation of your results more convincing and less ambiguous. Regarding the same results depicted on Figure 3, the difference in topography of this finding and of the areas involved in the correlation with the behavioural measure also suggests that they may not both reflect interception. It might be important to look at the onset of the heart beat because one would expect that if the difference really reflects interception, it should not depend on when after the face onset the beats appear. Though, the face presentations were very short, and it is not clear whether this would leave a lot of scope for testing this, and the differences in response to emotional faces could be sustained. And it is possible that the effects on interception are stronger closer to the onset of an emotional stimulus. The methodology is not sufficiently described to assess the validity of findings. How was the visual stimulation synchronised to the infant's heart beat? How did you achieve +/- 10% speed? In most infant looking studies a cut-off of 2 seconds is used to determine when attention was terminated. Justify why 3 seconds were used here. The ECG channel activity should also be correlated with the cardiac discrimination score, to rule out a cardiac contribution to the association between HEP and cardiac discrimination. This is justified also by the choice of a rather early time window for analysis – 150 ms after the R wave (compared to 50 ms after the T wave in Park et al., 2014) and which might correspond to a section of the HEP artefacted by the cardiac response itself. Was the heart beat latency from the onset of the visual stimuli, similar across conditions? A systematic difference in latency could lead to differential effects that do not reflect emotional processing but more general arousal/orienting. Discussion should stay closer to what the current data can tell about infant cognition or better justify the potential broader implications. The Discussion is rather speculative and the inferences made from the data unsubstantiated. The authors only measured discrimination between synchronous and asynchronous heart rate. Although there is a tendency to prefer asynchronous stimuli, this is not sufficient to infer that infants assigning positive or aversive value to this perception. As the authors correctly state, the HEP findings suggest that facial expressions influence the processing of interoceptive signals. The following (reversed) inference: "Even at this early age, infants' response to emotions appear to be closely influenced by their visceral reactions." cannot be drawn from the current data. The link to self-awareness seems un-motivated. Please explain why interception rather than any bodily sensation, is relevant to self-awareness. Trial number: I understand that the authors wanted to balance the amount of synchronous and asynchronous trials, and this is correct. However, because there are two asynchronous conditions this has led to double the amount of trials for the synchronous condition relative to each of the asynchronous conditions (faster, slower). Thus, the effect of novelty surrounding trial type also needs to be controlled for. Within the current paradigm there are three classes of stimulus speeds: average, fast, slow, that map onto synchronous, asynchronous and asynchronous. As there is reduced looking time for the synchronous trials, and there are also double these trials relative to fast and slow speeds, it is necessary to show that this difference does not derive from a reduction in novelty simply due to increased instances of this (average) trial speed. Could the authors please repeat analyses but using only the first half of synchronous trials to demonstrate that the direction of looking time still holds? It is ok if differences are now not significant, as the reduction in power from slashing half the trials is likely to be considerable, but it would be helpful to see that the direction of the effect is still present within the data (and that reduced looking time is not driven by the last half of synchronous trials). This type of analysis could be problematic if it then means more early trials for synchronous relative to asynchronous trials are included (and, say, looking time is significantly reduced with time). Thus the authors should feel free to offer their own solution on how to remove the confound between trial number, speed and synchronicity. Thank you for resubmitting your work entitled "Neurobehavioral evidence of interoceptive sensitivity in early infancy" for further consideration at eLife. After reading your reply to reviewers and your revised manuscript, I found your revision satisfying. You addressed all the points raised by the reviewers and myself, and the extra analysis you report seems to contradict the major issue I raised about the possibility that you might be measuring ERPs rather than HEP to emotional pictures. I am thus willing to accept your paper for publication, but I would like to point to one remaining issue that needs to be addressed before full acceptance. The extra analysis you carried out to disentangle ERP from HEP is reported in the reply while this should appear in manuscript, as it is not about just convincing me or the reviewers but also the reader that might have the same issue in mind when reading your paper. This could be done briefly in the Results or Discussion sections and with further details in the supplementary material. A major issue concerns the interpretation derived from the fact that emotional expressions modulate Heartbeat Evoked Potentials (HEP, Figure 3). The HEP is an EEG component which is time-locked to the heart beat. However, although they are differences across emotions, this might be the reflection of other sources that would show processing difference regardless of the heart beat: they might reflect the modulation of event-related potentials triggered by the emotional stimuli, although these amplitude differences would still show up when time-locking the analysis to the heart beat. In other terms, the reader might find this finding inconclusive and it seems important to show some degree of specificity to the HEP. This might be done by inspecting the results time-locked to the stimulus onset rather than the HEP, which might differ, or to show that some aspects of the HEP (for instance the phase) are 'specifically' modulated by emotional stimuli. This might also be discussed in an attempt to make the interpretation of your results more convincing and less ambiguous. We have now carried out an ERP analysis to investigate whether the emotional modulation of HEP that we report is distinct from the more general emotional modulation of ERPs. We accordingly entered the data from all infants included in the HEP analysis into our ERP analysis in order to detect any overlap in topography, which may cast doubt over our initial findings. The analysis was carried out using a Monte-Carlo random cluster permutation method, with a cluster-corrected p-value threshold of. 05, identical to the one used throughout the manuscript to ensure comparability. When interrogating the EEG signal for spatiotemporal clusters differentiating ERPs to fear or anger from neutral trials (the key contrasts for our HEP findings) across the entire duration of the emotional stimulus, no significant clusters were revealed in the frontal channels that the HEP analysis had identified as sensitive to fear and anger, respectively (hitherto referred to as the key ROIs). We then calculated the average amplitude from our ERP data in the key ROIs, and tested whether it correlated with average HEP amplitude; this should be the case if our HEP results were actually caused by ERP signal fluctuations. However, these correlations were non-significant for both fear (r=-.011, p=.962) and anger (r=.279, p=.209). Finally, we carried out a more specific analysis focussing in on the time period from 300-600ms after emotional expression onset, which has identified as a likely time-window of infant ERP to emotional expressions (following Kobiella, Grossmann, Reid & Striano, 2007). Again, no clusters were identified that were significantly modulated by emotion in this time window in the key ROIs, and there were no significant correlations between average amplitude and HEP amplitude, either for fear (r-.171, p=.470) or anger (r=.175, p=.436). The results of these analyses suggest that the emotional modulation of the HEP signal in frontal areas is not an artefact of more general ERPs in response to these emotions in the same locations. At the same time we would like to reiterate that our experimental paradigm was designed to enable us to analyse HEP during emotional observation (of which there are many occurring in each emotion trial), As a result the infants included in our analysis did not necessarily complete a sufficient number of artefact-free emotion trials to provide as a reliable and detailed ERP analysis (in which only one segment can be obtained from each trial as one would expect for an experimental design tailored to study ERPs to emotional faces, e.g. Missana, Grigutsch & Grossmann, 2014). Although we agree that it would be interesting to investigate how the emotional modulation of HEP changes across the time course of a trial, we fully agree with the several valid challenges that the reviewer raises to this approach, including the issue of our short trials which are not optimised for an analysis of the effects of stimulus duration. Furthermore, it is not clear what would be predicted from such an analysis, or what results would strengthen or challenge our existing conclusions. It is certainly possible that the emotional modulation of HEP is strongest at the onset of an emotional expression, but conversely it is also feasible that the emotional modulation increases as the intensity of the emotional expression builds, and we do not think that either of these plausible options preclude the involvement of interoception. Therefore, on the basis of the reasons provided by reviewer 1 and the nature of our experimental design, we agree that this analysis wouldn’t be informative. Perhaps a different experimental design that has shortened or even static facial expressions could perhaps answer the reviewer’s question, and will be considered in future experiments. Although 2 seconds is a common cut-off in infant looking paradigms, previous infant studies have varied and several have used either 1 second (e.g. Phillips-Silver & Trainor, 2005) or 3 seconds, (e.g. Mareschal & Johnson, 2003). We decided to use the longer cut-off of 3 seconds because during piloting, we observed that infants often became very active with accompanying head and limb movement during the rhythmic stimulus which could have resulted in temporary loss of eye-tracking signal. Given that our stimulus presentation was automatically controlled by an online algorithm based on the eyetracking signal, rather than experimenter-controlled, we aimed to minimise the number of valid trials terminated prematurely. The ECG channel activity should also be correlated with the cardiac discrimination score, to rule out a cardiac contribution to the association between HEP and cardiac discrimination. This is justified also by the choice of a rather early time window for analysis – 150 ms after the R wave (compared to 50 ms after the T wave in Park et al., 2014) and which might correspond to a section of the HEP artefacted by the cardiac response itself. The earlier time-window selected for analysis was necessary due to the very rapid nature of the infant heart rate. This is explained in the fifth paragraph of the main text. The Park et al. study referred to is an MEG study rather than EEG, and most crucially uses adult participants whose heart rates are approximately half that of our infants. Although ECG components other than the R wave are not easy to identify from our data due to the montage of the external electrode, it is likely that the 150-300ms post-R-wave window we selected does indeed encompass the T wave of the infant ECG. Our 300ms upper cut-off ensures that the time-window was not contaminated by the following heartbeat. This is an interesting point, but as you know it is theoretically difficult to separate arousal from emotion (see e.g. Luft, C. D. B., & Bhattacharya, J. (2015). Aroused with heart: modulation of heartbeat evoked potential by arousal induction and its oscillatory correlates. Scientific Reports, 5, 15717). Therefore, from a conceptual point of view, we would not want to claim that our results were attributed to ‘pure’ emotional processing devoid of changes in arousal. However, there are also some methodological challenges raised by an attempt to analyse heartbeat latency as the reviewer suggests. We used dynamic emotional facial expressions in our study partly to avoid the potentially confounding role of an orienting response to the sudden onset of a full-intensity static emotional expression. As these emotional stimuli were videos, which initially showed a neutral expression before dynamically moving into showing an emotion, it is unclear to us what the ‘onset’ of the emotional expression could be defined as, i.e. the moment that infants would be predicted to have a cardiac orienting/attentional response. However, to allay any concern, we analysed the latency between the onset of the dynamic period of the emotional video and the infants’ next heartbeat, for all four emotion conditions. We then compared the latency for fear and anger conditions to the neutral condition, to mirror the key significant comparisons yielding our HEP results. The latencies for both fear (M=207ms, SD=58) and anger (M=238, SD=56) did not significantly differ from those of the neutral condition (M=221, SD=59, p>.05). Therefore, it seems unlikely that systematic differences in heartbeat latency can explain our HEP results. We have now removed this statement, as we agree that the reversed inference is not valid. There is a wide and rapidly-growing literature specifically linking interoception with self-awareness. We do not claim that only interoceptive sensations are relevant for self-awareness, but instead we emphasize the role that interoceptive information together with exteroceptive information about the body in co-constituting self-awareness, as other highly-cited theoretical accounts have suggested (e.g. Damasio, 2010; Craig, 2009), and have recently received growing empirical support (e.g. Tsakiris, Tajadura-Jiménez & Costantini, 2011; Suzuki, Garfinkel, Critchley, & Seth, 2013; Aspell, Lenggenhager, & Blanke, 2009; Allen et al., 2016; Seth, 2013). Readers are directed to some of these references, in the seventh paragraph of the main text, to back up our point. We thank the reviewer for this important point. It is correct that infants saw twice as many trials classified as ‘synchronous’ than those classified as ‘faster’ or ‘slower’. However, crucially, the rate of presented beats for the asynchronous trials was calculated as ± 10% of the mean heart rate of the previous (synchronous) trial. We apologise that we had omitted these key details regarding how the rhythm of the asynchronous trials were presented in the original manuscript (also see reviewer 1 point 2) and so we have now inserted more information in the Materials and methods section. Due to normal fluctuations in infants’ heartrate during the task, our method meant that individual trials within a certain trial type differed with regards to their speed of beat presentation. For example, any given ‘asynch-faster’ trial was 10% faster relative to the infant’s heart rate during the previous trial, and therefore was unlikely to be exactly the same rhythm as any other trial classified as ‘asynch-faster’. As infants’ heart rates fluctuated, any given trial categorised as, for example, ‘asynch-faster’ could easily be presented at a rhythm close to, or slower than, a randomly selected trial categorised as ‘synchronous’, and the same for ‘asynch-slower’ trials. Thus, the trial designations (synch, asynch-faster, asynch-slower) are only relevant in the context of the infant’s changing heartbeat rhythm and do not reflect absolute or fixed stimulus characteristics relative to an external measure (i.e. fixed number of milliseconds between beats). To illustrate this, we calculated the mean, standard deviation and range of inter-beat intervals for each infant and each condition; M(asynch-faster) = 375ms (SD=15), range = 361-392ms, M(asynch-slower) = 417ms (SD = 18), range = 399-436ms, M(synch) = 398ms (SD = 18), range = 376-419ms (see Figure 1—figure supplement 2). Overall, from this we can see that there was a high degree of overlap, at a group level, in the ranges of inter-beat intervals presented between the three conditions across the task. More importantly, at an individual level, mean ranges of interbeat-intervals calculated for each infant showed that the range of synchronous IBIs that any one infant experienced overlapped with the range of asynch-faster IBI’s by an average of 16ms, and with the range of asynch-slower IBIs by an average of 19ms. Therefore, for our results to be an artefact of habituation, infants must have habituated to a changing range of heartbeat speeds presented during ‘synchronous’ trials (on average, 376-419ms) but not to two other fluctuating ranges of heartbeat speeds (361-392ms, and 399-436ms) with which the synchronous range overlaps. For this reason, we believe that it is very unlikely that habituation to an external stimulus characteristic such as absolute duration between beats could explain our results. However, we do consider it likely that our results are due to a novelty/habituation effect to a relative stimulus characteristic, namely the relationship between the stimulus and the infant’s heartbeat, and this is part of our central claim of the study, as our task was precisely designed to probe the infant’s sensitivity to interoceptive signals. However, to further allay any concerns, we also conducted an additional analysis. We followed the suggestion of the reviewer and analysed only the first half of the synchronous trials. As predicted, the lack of power resulted in non-significance, but the looking times to synchronous trials were still numerically lower (4944ms, SD=3087) than those to slower (5925ms, SD=3250) and faster (5045ms, SD=3097) trials. However, as the reviewer suggested, looking duration did reduce over time for all conditions and therefore there was a confound between trial number, speed and synchrony. […] The extra analysis you carried out to disentangle ERP from HEP is reported in the reply while this should appear in manuscript, as it is not about just convincing me or the reviewers but also the reader that might have the same issue in mind when reading your paper. This could be done briefly in the Results or Discussion sections and with further details in the supplementary material. We have now followed your advice and inserted our ERP analysis in the manuscript. This study was supported by a BIAL Foundation Grant for Research Project 087/2014 to LM and MT and the European Research Council [ERC- 2010-StG-262853] under the FP7 to MT. Human subjects: Informed consent was obtained from the caregivers of all infants involved in the study. Informed consent was also obtained from the caregiver of the infant featured in Figure 1A. All methods were explicitly approved by the Royal Holloway Department of Psychology Ethics Committee, reference code 2015/050R1. © 2017, Maister et al.